Writing is a funny kind of business. Especially writing for something as wide-spread and potentially influential, as Face Book. I like writing. I’ve been doing it for a lot of years…a whole lot of years. I like to write funny, even if the topic I’ve chosen is terribly serious, like childbirth or war or losing the last five pounds on your way to a perfect size six. The trouble is, there is no way to really “know your audience” which is, of course, absolutely essential if your desire is to write something people really want to read about. I know the potential readership onFace Bool is up there in unimaginable numbers. Not that most of them, not even a couple of thousand of them, are lining up each month to see what gems you have in mind for them this time. It isn’t the number that is so intimidating it is the anonymity of them. I am, by nature, kind of skittish. I don’t want to say anything that is going to upset anybody. I would like to think that is because I am one of the world’s most empathetic of people. I don’t want to hurt anybody’s feelings or insult their ancestors or anything like that. That’s what I would like to think. The fact is however, I am afraid of backlash. I have this need to be – not loved perhaps – but at least liked. I don’t want people to find me abrasive or divisive or any of those other ive things that are so prevalent these days. But folks? Have you read FaceBook lately? It is a melting pot of hates. People on the left hate everyone on the right and the guys in the middle can’t imagine how all of you “fanatics” could have arrived at your god awful decisions! Nobody cuts anybody any slack “You are either for me or against me and I really don’t want to talk about it.” seems to be the accepted position. I think that once, long ago, perhaps when I was an impressionable teenager or maybe even into my twenties, I was one of those people. I was in a very democratic university and we loved to love everyone. It made us part of the changing world and all the student leaders were agreed…”We would overcome” just about anything that stood in our way. It took me a long time to discover that our solidarity was based on a united front of agreement on the fact that people who didn’t think like us were – at the least – idiots. At their worst, they were evil. We were a part of a democratic society which only loved other liberals. However, it was also at that same university that I discovered, much to my dismay, that we had not all evolved to this lofty plain. I was a member of a business fraternity for women. See, even the title was evolved. We were a Fraternity – a place where we could all be equals…but it was for women only. That’s a subtlety that escaped me at the time. But be kind…it was 1947. Rosie was only recently riveting. Anyway, I was elected president of the Fraternity and was going to a meeting of all the chapters somewhere in Chicago I believe. There was a motion on the table that was to deal with at that meeting: Should this Fraternity admit either or both Japanese or Jewish students. Wait! We had been excluding people on purpose? I thought we just didn’t know anyone who wasn’t – oops – just like us! Okay, I thought, this is a no brainer. We just vote everybody in. Easy, huh? But no. It wasn’t easy at all. The Fraternity members voted to admit the Japanese students! But I was wrong. You didn’t HAVE TO do anything. I tried to resign my position but it was pointed out that I had agreed to represent the organization and to present its positions etc…so I went. I presented their positions and then I resigned and left. I was VERY proud of me. Of course I was no longer a member in good standing, but I felt so – so – gloriously righteous. I turned on them as quickly as they turned on me. People I thought of as friends or at least Fraternity sisters ceased to be individuals to me. They were all lumped into one big group of people who were too stupid to see clearly what was so obvious to me. That lasted a couple of days and then I began to realize that I missed some of them. That I like most things about many of them. Now, just in case you’ve been wondering where I’m going with this whole meandering theme, here it is. I realized that, despite our disagreements, they were still basically nice people. I might hate their social opinions, but that didn’t mean they had suddenly lost everything that was good about them. It meant instead that they thought in a different fashion from me. Instead of sending out hate filled, foul-word laced accusations, I should talk with them. Understand how they got where they were and if there was anything – short of accusing them – that I could do to have them rethink, I should do that. I’m still working at that. I believe I have reached a spot where I can agree to disagree. We have to learn to respect other people’s ideas however wrong we feel they are. I have friends who are what are referred to as Cafeteria Catholics meaning they embrace the church, just not all the dishes put on the table. But they don’t give up on the entire organization or all the people who still DO believe that the whole dinner is perfect. I cannot see for a moment how so many voters decided that giving almost anyone a gun would solve the world’s problems. Talk about it. Face to Face, not Face Book to Face Book where you can lash out and hide at the same time. But then neither can I see how sitting at home composing Face Book essays on how anyone who likes Obama is a crazy person whose ancestry is in question as seriously as the President’s. Or that by taking a stand against Obama you are proving that you are thinking without a brain. Republicans come in as many different shapes, sizes and colors as do Democrats and Liberals are a whole rainbow of their own. But no one group melds into a solid block of idiocrats who think everything the entire party stands for is perfect. We really have to buy smaller paint brushes. Or better yet…throw away the paint brushes and go out and talk to those people who don’t think like we think and try to understand how they got where they are. I’m not saying it is easy. About a month or so ago, I had a conversation with someone I’d thought of as a fairly rational being until he said he thought he’d vote for Donald Trump. I started to make a joke but then I saw it. He actually meant it. He WOULD vote for Donald Trump for President of the United States. I can’t believe I know someone who would do that. @#$%^*&. Another of the marvelous pictures from Bobill Weaver’s collection. I have a bit of a personal history with these little beauties. 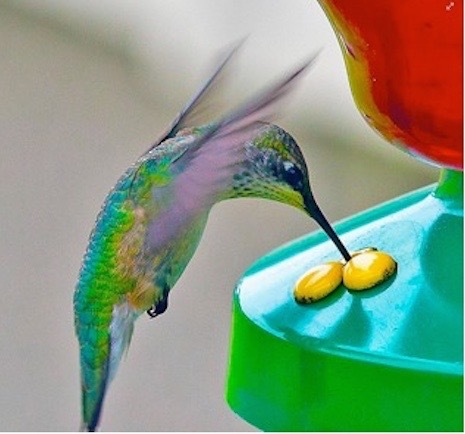 I love to watch hummingbirds and I think the natural flowers are better for them than the red sugar water that is used to entice them. So I went out and spent about $100.00 on plants with red flowers that I’d read would bring the little darlings to me. My neighbor put up a $19.95 red lantern-like device. Guess where the birds are.